The Call for Speakers for The National 2019 is now closed! The APMA Annual Meeting Committee is seeking innovative lectures on foot and ankle medicine for the APMA 2019 Annual Scientific Meeting (The National), July 11–14 in Salt Lake City. Broad topic areas include surgery, biomechanics, dermatology, complications, wound care, and trauma; however, any topic related to foot and ankle care will be considered. 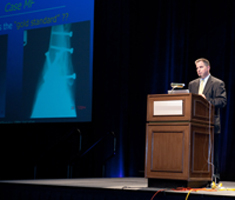 If you are interested in sharing your expertise with APMA’s membership, please submit your lecture topic(s) online, through our new Call for Speakers portal by October 19, 2018. DPMs must be APMA members in good standing to be considered for the faculty. Go to the Call for Speakers site. Select “Enter Now”, then select “Click Here” under “New to This Site?” on the left side of the screen. Fill out the required (and optional, if desired) speaker fields. Note: If someone else is filling out the application on your behalf, these responses should correspond to the presenting physician. Disclose any financial relationships. If you have a disclosure, enter the name of the commercial interest and the nature of the relationship, then click “Add.” Complete this step for all financial relationships. Select and upload a current CV (in PDF). Provide the presentation title and learning objectives, then select “Add New Presentation.” Once you click this button, you will receive a confirmation that your presentation was successfully submitted for consideration. You can add additional presentation topics or modify a submission until the Call for Speakers deadline on October 19. Once all submissions are received, the Annual Meeting Committee will review the presentations. Please note: The final decision on the educational program for the Annual Scientific Meeting is made by the Board of Trustees based on the recommendations of the Annual Meeting Committee.